And the goodie boxes are filled and ready…. 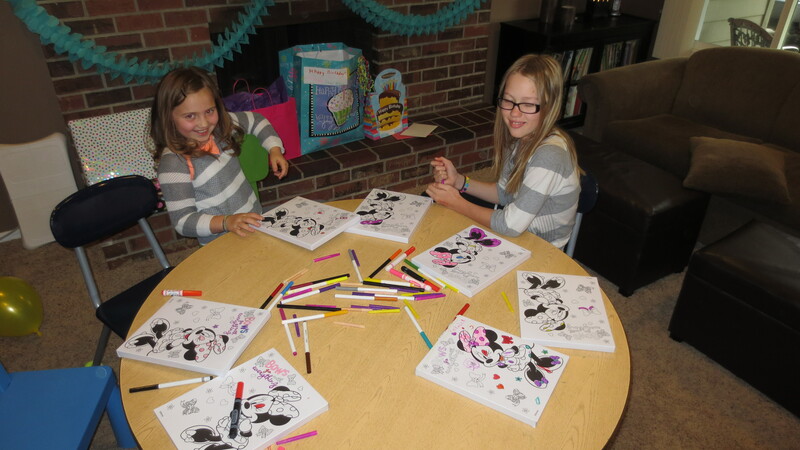 As the girls came in, the first thing they did was color the Minnie Mouse canvas pictures that I picked up at the Dollar Tree. Which sort of got out of control – who could color the worst with lots of scribbling and poking holes in the pictures. They also took turns applying eye-shadow to each other. And they all chose images for their magnet craft. The “H” and “M” are for our BBQ to differentiate if we have Hickory or Mesquite pellets in the hopper. Anyway, once everyone was made-up and they were done with their coloring, we ate pizza and drank some fancy beverages from fancy glasses! The drinks were a small scoop of vanilla ice-cream, topped with Sprite. Next up was cupcake decorating! Then the silliness hit! (Actually it was there all along). They thought the fancy glasses were extra cool and pretended to be fancy ladies….. cheers! Next Next post: Weekend Happenings: Fort Revolution Spreading 4 Days!